In an unbylined update of the latest developments in the budget-tax-spending-debt ceiling discussions in Washington this morning, the Associated Press committed several blunders in attempting to explain what's going on and how we got to where we are. First and foremost was its list identifying "contributors" to the $8.5 trillion growth in the national debt since 2001. - 2001 and 2003 tax cuts under President George W. Bush: $1.6 trillion. - Additional interest costs: $1.4 trillion. - Wars in Iraq and Afghanistan: $1.3 trillion. - Economic stimulus package under Obama: $800 billion. - 2010 tax cuts (these weren't cuts at all; they were really a continuation of the current income tax structure -- Ed. ), a compromise by Obama and Republicans that extended jobless benefits and cut payroll taxes: $400 billion. - 2003 creation of Medicare's prescription drug benefit: $300 billion. - 2008 financial industry bailout: $200 billion. - Hundreds of billions less in revenue than expected since the Great Recession began in December 2007. - Other spending increases in domestic, farm and defense programs, adding lesser amounts. The graph doesn't show collections tanking, does it? 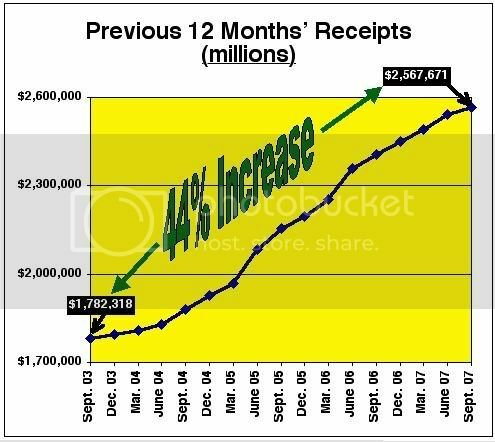 Instead, the graph shows that collections increased by 44%, or almost $800 billion, in four years. 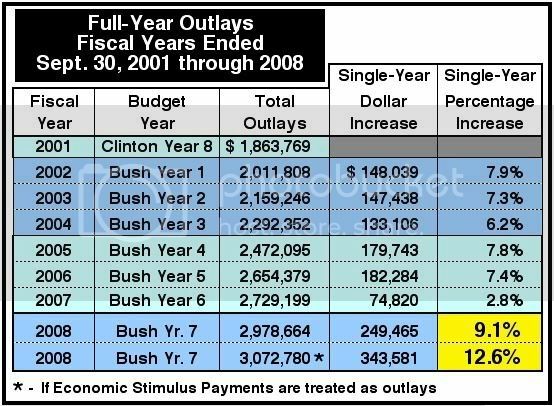 Adding up the individual increments in each of the four years compared to 2003 (2004 - $98B; 2005 - $371B; 2006 - $624B; 2007 - $785B; 2008, not shown, treating IRS stimulus payments as outlays instead of negative receipts - $835B), what really happened is that in the five full fiscal years after George W. Bush got the across-the-board and investment-related tax cuts he had been pushing for since taking office in 2001, the cumulative increase in tax collections was over $2.7 trillion. Doubtless, the static analysis crowd will claim that collections would have been even higher (I guess by a cumulative $1.6 trillion, given the AP's Democratic Party talking point above) if the Bush cuts hadn't been enacted. Two words, guys: Prove it. Two follow-up words: You can't. We can argue all day long about the how much of the increase in collections was due to the incentive effects of the tax cuts and how of the improvement might have occurred anyway, but no one can credibly act as if it's an established fact that the Bush cuts somehow caused collections to go $1.6 trillion in the opposite direction. There is absolutely no proof for this contention, and plenty of evidence that the Bush cuts jump-started an economy and federal collections, both of which had been flat or declining during the two years leading up to mid-2003. The more reasonable conclusion to reach is that the country would already be dead in the water if the Bush tax cuts hadn't passed in 2003. Instead, the wire service hopes that its "Bush tax cuts cost us" meme will be gullibly recited during the next several days at its subscribing newspaper, TV, and radio outlets. "Disgraceful" doesn't even begin to describe this pathetic promotion of self-evident falsehood. If we turn the tables and (in my opinion) safely assume that there was no need to increase the overall level of spending beyond what was seen in fiscal 2007 except to allow a probably overly generous $100 billion in increases each year, the fact is that by September 2011, the Pelosi-Reid Congress and the Pelosi-Reid-Obama triumvirate will have spent roughly $2.7 trillion more than they needed to, or should have. And oh by the way, by September 2011, the collections shortfalls since the end of fiscal 2008 will total roughly $1.3 trillion, not the "hundreds of billions" the AP lazily reported. The AP also erred, as it did back in 2009 (and probably has done at other times not detected by yours truly), by incompletely explaining how the national debt has grown. For a separate explanation of why the wire service's assertion that "The debt is the sum of deficits past and present" is incorrect, go here. This repeated error betrays the depth of consistent and persistent ignorance which pervade the Essential Global News Network.